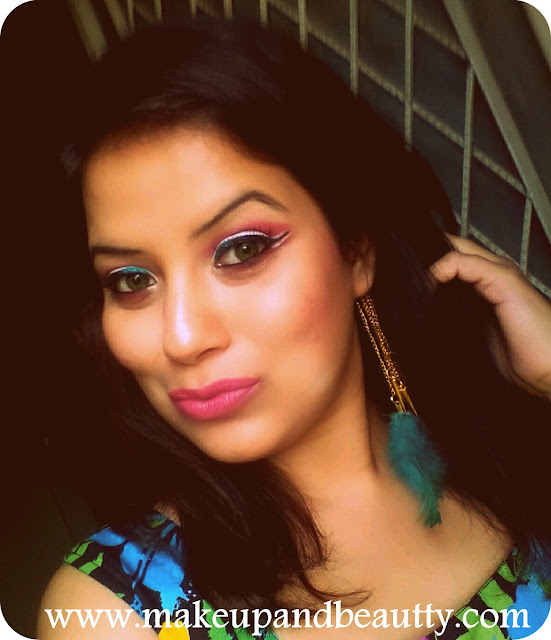 As the fever of Nyx mania is increasing its hotness in me so I am here today with another Nyx product review. 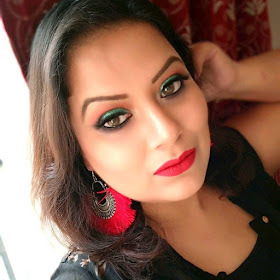 I already reviewed a beautiful Nyx matte lipstick (you can read it here) that I paired with my recent look ( I posted on my page a few days back). So today I am going to talk about the eyes, the look I created with Nyx ultimate Eyeshadow palette in shade Brights. 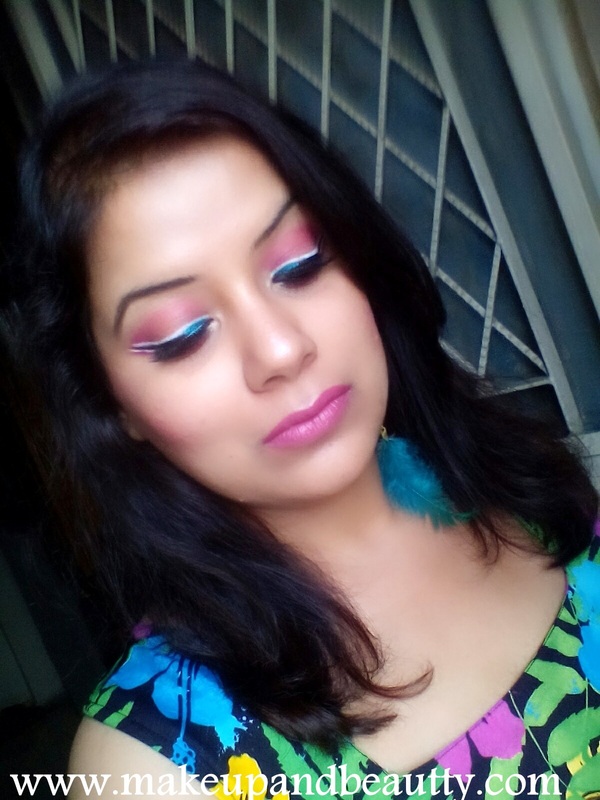 Only a Bright palette has the capability to create a bright look, and so when I lay my hands on this palette I came out with something different apart from my usual look. The palette that reminds me of Summer Bright looks finally drags me to create one. Nyx Ultimate Eyeshadow palette comes up in three different shades, Smokey and highlight, Brights and Warm Neutrals. Among the three I pick up “BRIGHTS” one. 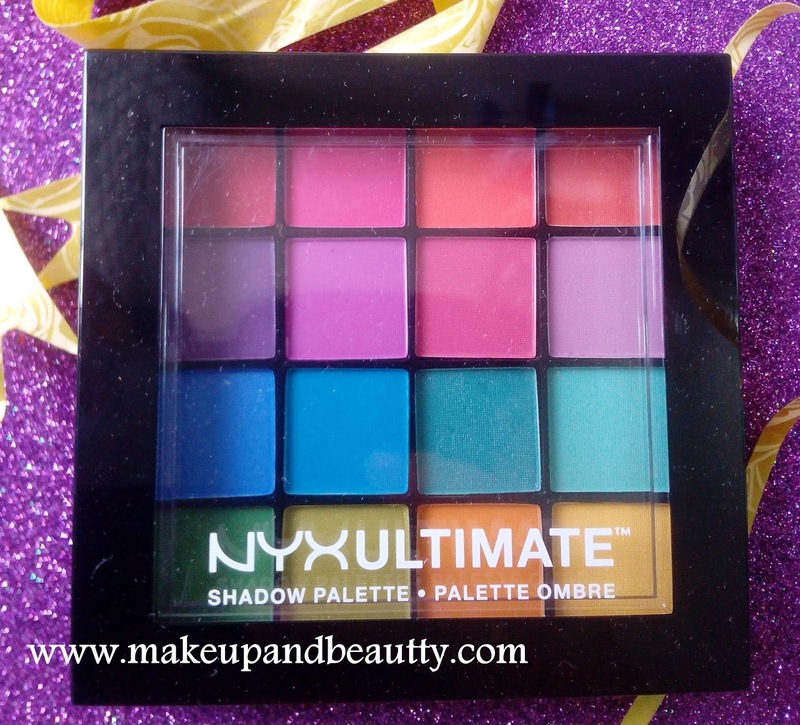 Nyx Ultimate eyeshadow palette has 16 beautiful bright shades that come up in a small sturdy case. 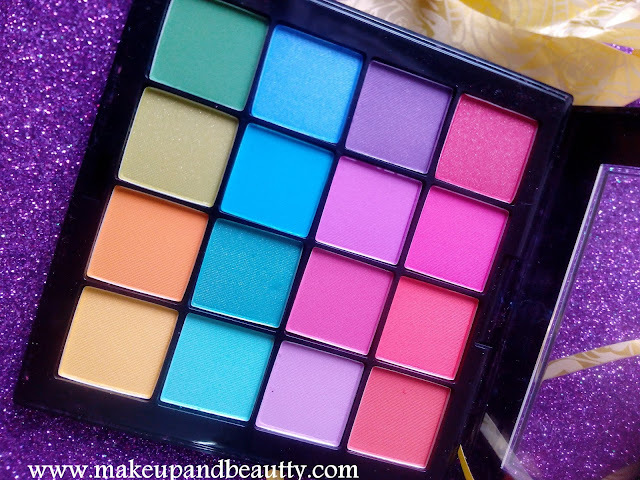 The palette has the mixture of bright matte and shimmer shades. It has four row that is beautifully coordinated with a range of colors. 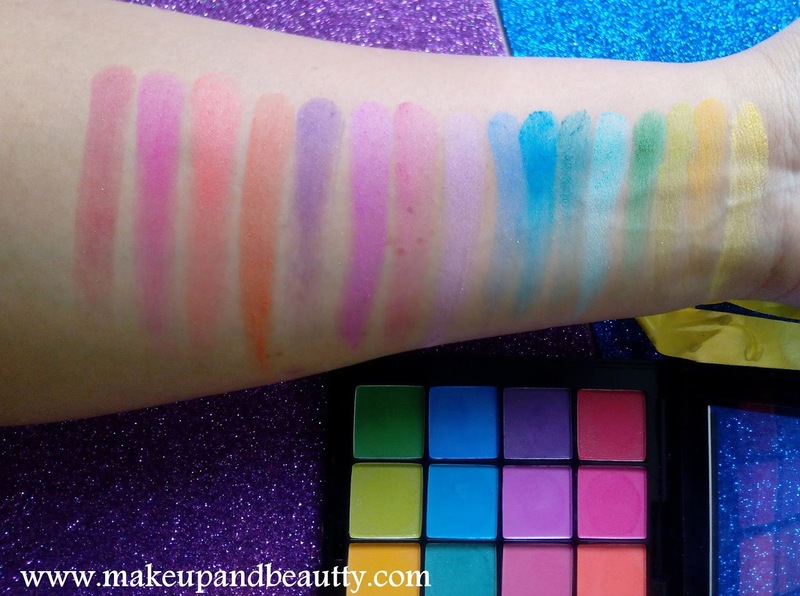 Among the 16 shades 13 are eyeshadows while 3 are pressed pigments. The first row from the top has the range of reds and pinks while the second row has the range of violets and lavender. The third row has four pretty shades of blue that reminds me of the bright clear sky, while the last row having green and shades of yellow and orange reminds me a colorful scenario of summer. Rs.1725/- for 13.28g. 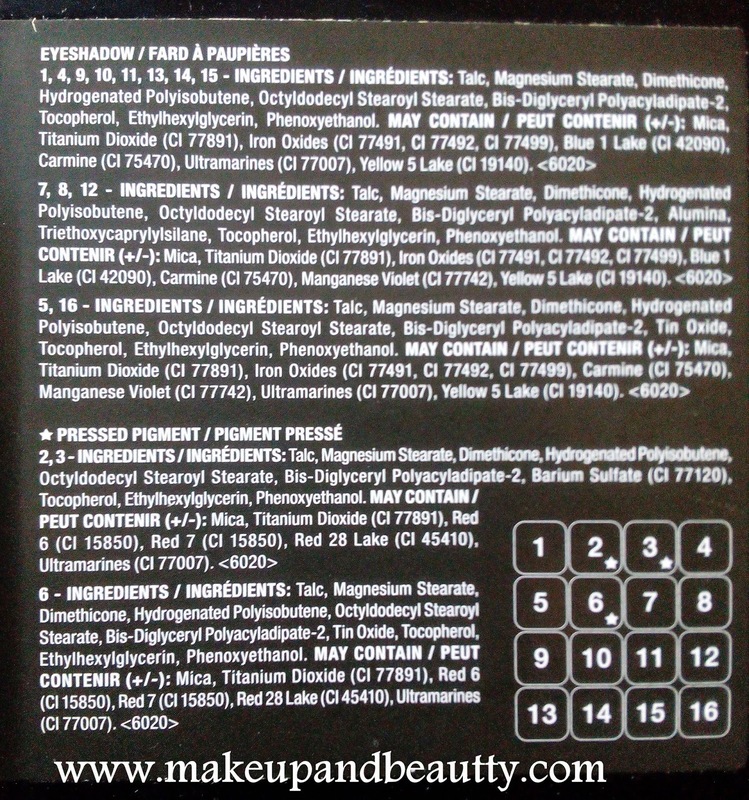 Each eyeshadow is 0.83g/0.02 oz. 1001 color combinations for your eyes! 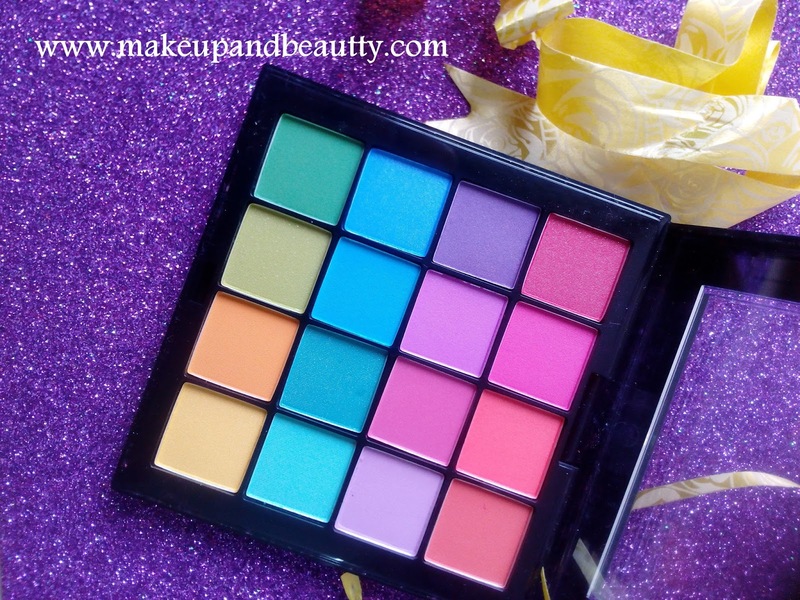 The pro-level palette is truly the Ultimate Shadow Palettes featuring 16 expertly coordinated color combination eyeshadows, from naturals to smokies to pop. Each set features a vivid mix of velvety-rich textures and mesmerizing finishes that range from mattes and satins to shimmers and metallics. The range of finishes allows different looks from smoky to natural to pop. NYX Cosmetics is a leading US Based makeup brand loved globally by all beauty lovers and professional makeup artists.NYX offers an exceptional quality of professional makeup & beauty products in super stylish and modern packaging.The Brand has a variety of cosmetics ranging from their highly pigmented and striking lipsticks and glosses, eye-catching eyeshadows, eye and lip liners, high coverage base makeup foundation, concealers and primers for all skin types along with stunning eye palettes, eyeshadows and makeup brushes to choose from. 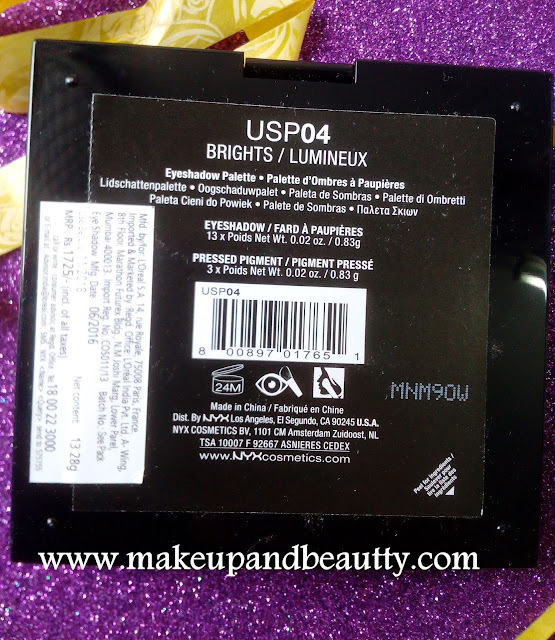 The palette comes in a black case with a see through transparent lid having a black border. The case looks really classy and cute. 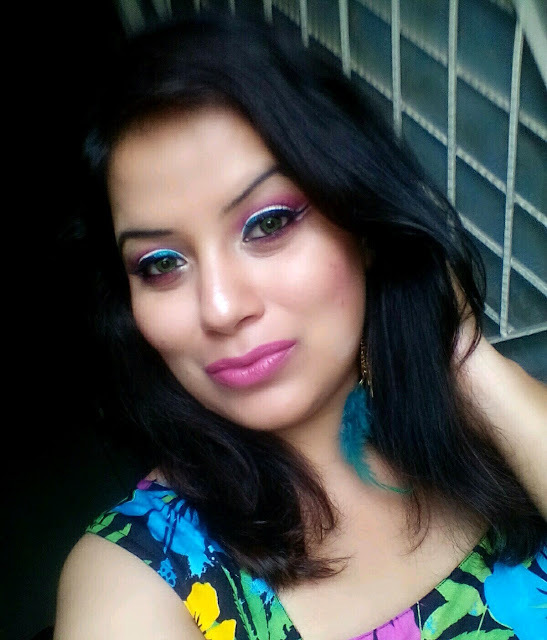 All the shades are visible from outside and so it is easy to pick from stash full of eyeshadow palette. The lid closure close tightly with a click sound while one has to force the lid with nails to open it. 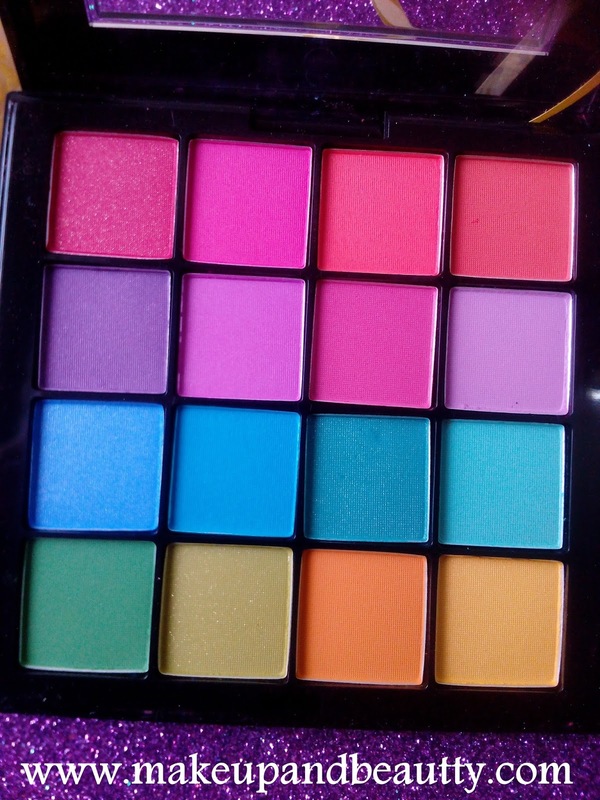 So it is a travel-friendly palette. The palette is not huge that you can’t carry in bag neither so small that you can keep it in your purse. It is a nice 4 inch x 4-inch size palette. First of all, I will admit that I am little disappointed with the size of palette compare to the big amount I invest to get it. The palette is just 4 by 4-inch size and each eyeshadow is 0.83gm. But as the tag of expiry has noted down below in the palette so after receiving it I was quite okay with it as I knew I need to use up this one pretty fast (although I know if proper hygiene is maintained, any eyeshadows last for ages. They don’t expire actually). Coming to the texture, I must say all the shades are damn pretty and have buttery/velvety texture. 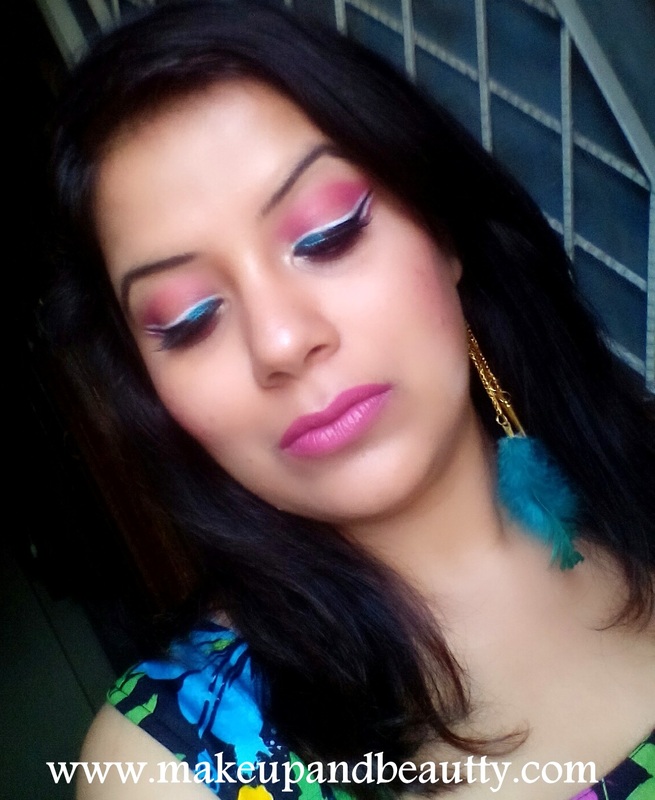 They blend smoothly and there are minimal fallouts. 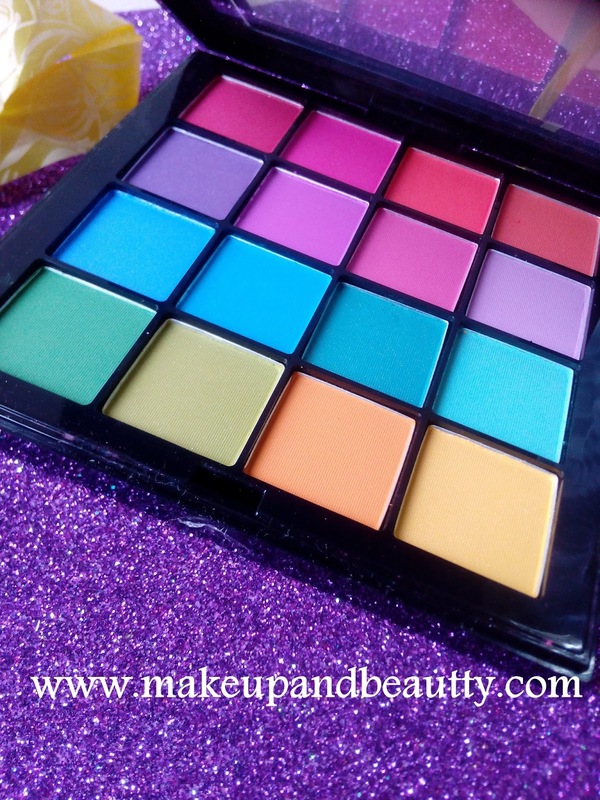 The palette is a perfect combo of all bright shades. The shades are much pigmented. And they beautifully blend on eyelids. All the shades stay pretty 5 hours without primer and with primer it stays little longer. The size of each shade might be little bothering as they are so small according to eyeshadows from other brands. The palette again has no mirror or eyeshadow applicator/brush so one had to carry both separately. Overall the palette is very pretty. All the shades are pigmented and have the velvety texture that blends flawlessly on my lids but I personally think the price of the palette is little pricey compared to the quantity we are getting in it. 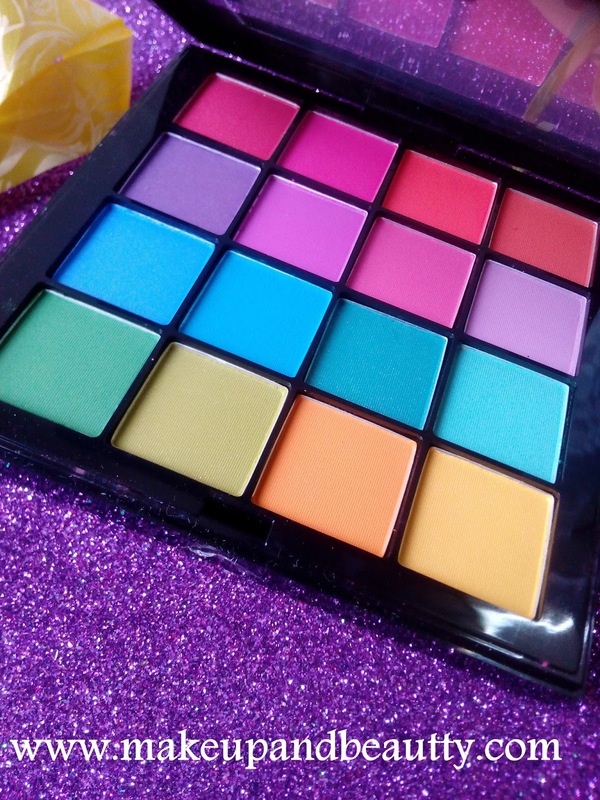 Otherwise, it is a great palette and if you are a makeup enthusiastic then this palette will increase the brightness of your stash and in your makeup. 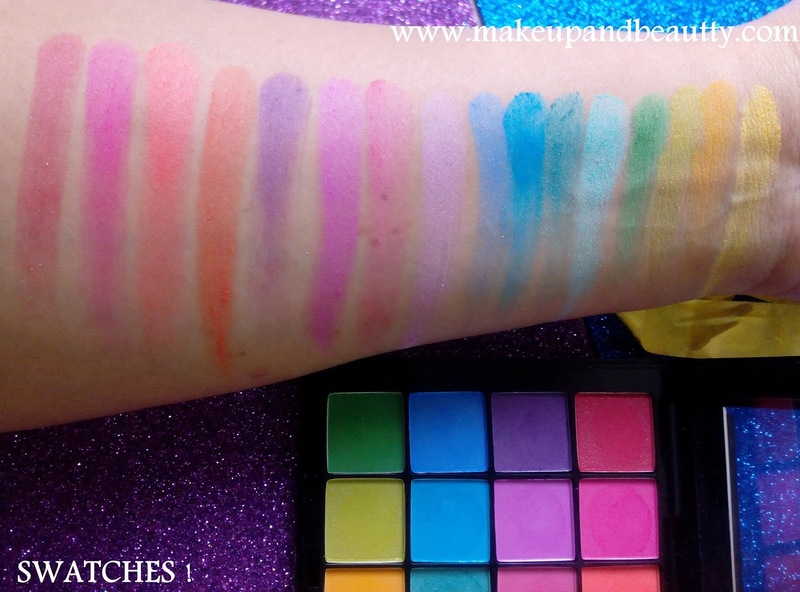 Here are the swatches of eyeshadows along with an FOTD where I created the eye look using few shades from the palette along with the lipstick from Nyx too that I already reviewed here.